Want more power from your 'Bird without wielding the die grinder or ripping your seat or airbox apart? 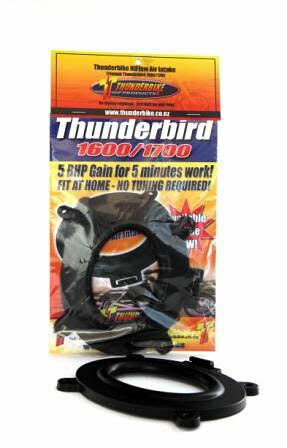 Thunderbike present a high flow airbox lid that will allow your engine to breathe without breaking the bank - or a sweat! A straight bolt on replacement for the original lid including the hook for the battery strap. No need for an expensive aftermarket fueling product or dyno time. Use with the original equipment filter or with a UNI filter. We now stock Uniflow Australia Uni Filters to fit the Thunderbird and have a special deal for customers who buy both in one order below. Save 10% and consolidate the shipping, it's a win win situation! Find out more about the Uniflow Uni Filter HERE. Please note: These lids do not currently fit the K&N filters.They are suitable for the foam topped filters only. They are also not suitable for the Commander or the LT models. We are currently working on a version for these. Contact us to be notified when they are ready. 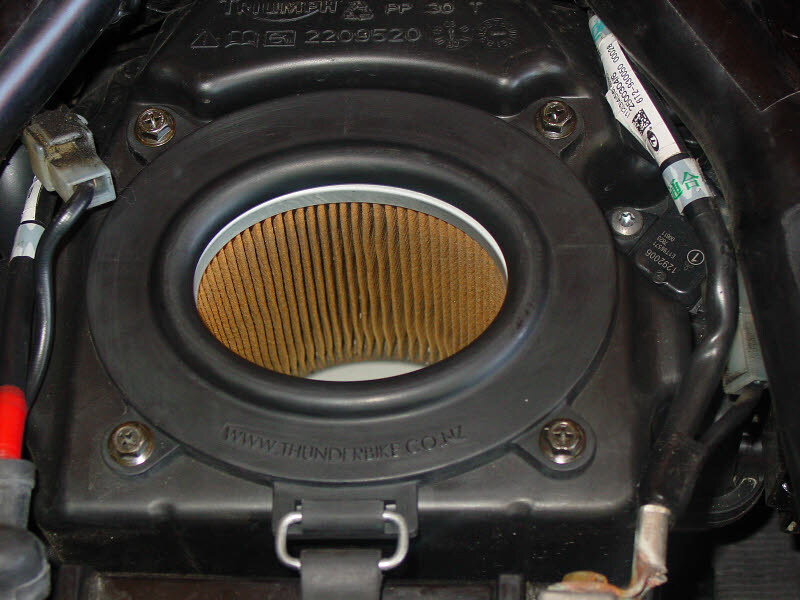 These have been designed using the latest 3D solid modelling software to have the optimum dimension of intake opening and area and a parabolic trumpet to increase air velocity into the filter. The trumpet is raised to help reduce water ingress but not so far as to restrict air flow under the seat. There is no need to remove the under seat ducting. 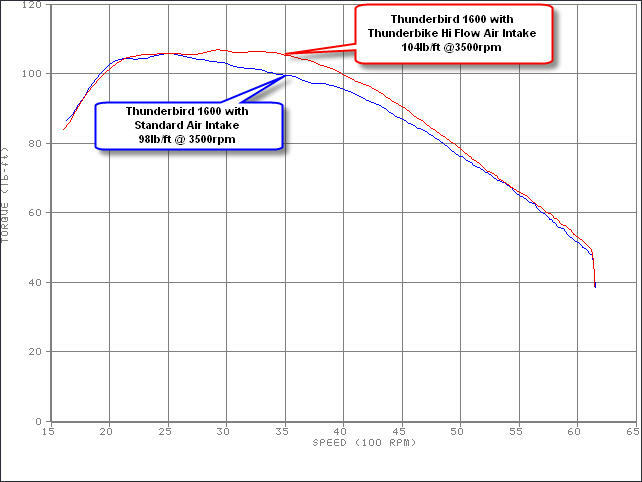 Testing has shown a 5bhp gain at 3700rpm & 4bhp gain at 4500rpm, see for yourself on the dyno charts at the side. 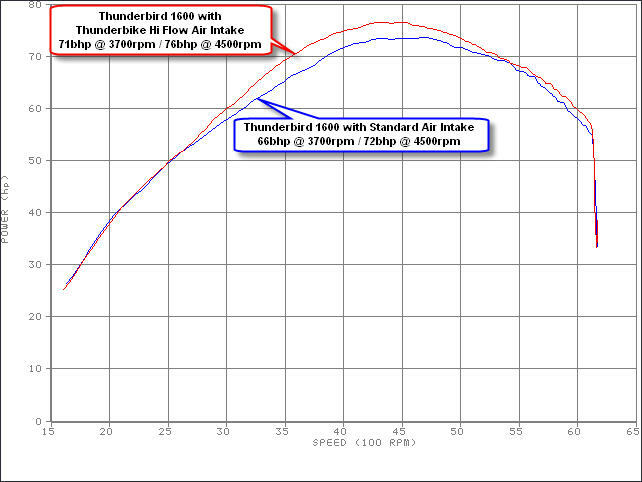 Dyno runs conducted with Triumph long aftermarket pipes, standard filter and Triumph aftermarket pipe tune 020306. NOTE: You WILL NOT require an aftermarket fueling device with this intake. Took 10 mins or less to install and right at start up something sounded different To clarify this is for my Thunderbird Storm. Took it for a 125 mile ride 60+ miles each way Highway miles some stop-n-go and there was definitely a little more pep. Didnt feel it right away. Too busy enjoying being on the bike after a hectic week but later I totally noticed it.